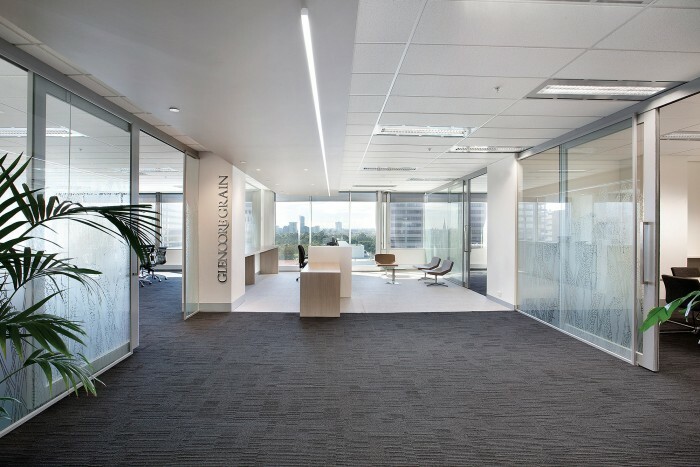 Design and construction of the entire Level 8 of 484 St Kilda Road for clients Glencore Grain consist of 140 workstations, 7 offices, large staff break out area, substantial store room, 2 meeting rooms and a generous reception area which opens to 2 large boardrooms. The finishes and materials used where of modern, minimal, raw and fresh to bring out the natural ingredients of the companies trades (wheat, corn, barley, rice oilseeds and biodiesel). The overall fit out was a spacious and generous layout with fresh open materials suitable for corporate entertaining for clients and enjoyable casual retreat accommodations and working culture for staff.